The biggest tech company in the world hasn't been burned by the techlash. Apple, which is currently worth $945 billion and on track to become the first-ever trillion-dollar company, has avoided the intense scrutiny placed on other tech firms by the public, lawmakers and the media. How? By being boring and, as far as we know, well-behaved. While Facebook and Google have come under fire for their handling of user data, and Amazon is consistently cited as the most disruptive economic force of our time, Apple has flown under the radar by (mostly) avoiding scandal and promoting good values. Apple has also capitalized on others' failures, particularly Facebook. 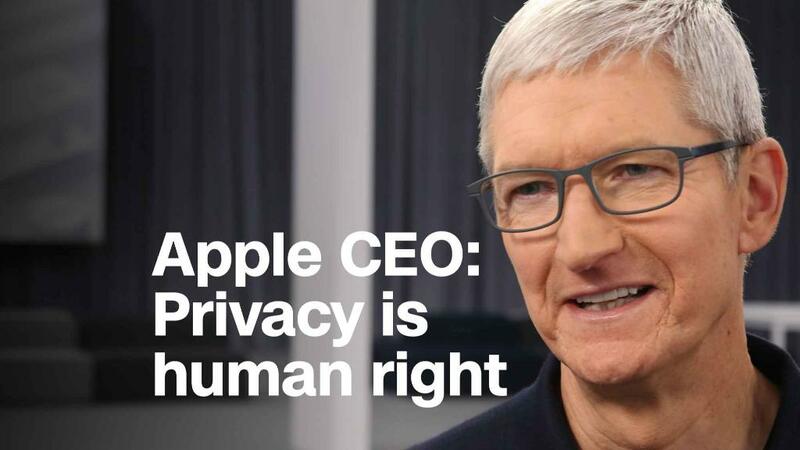 By stressing the importance of data privacy -- both in public remarks and now through a feature on its Safari web browser -- Apple is distancing itself from the other tech giants and casting itself as a model of responsibility. "We believe one of the most offensive things is when you are on another website but this website that you were on three or four times earlier is still tracking what you're doing," CEO Tim Cook told CNN's Laurie Segall on Monday. "We don't think that's reasonable for people." "We write our privacy policies in plain language around the world so people will know exactly what we're doing," he said, "and we're not in the business of monetizing your data." Apple's strategy has been to combine its own noble principles with an aggressive, competitive instinct -- taking the high road while simultaneously disparaging a competitor. Facebook executives have chafed at Apple's public criticisms, sources at the social media company said. On Monday, Facebook's chief security officer Alex Stamos questioned whether Apple was serious about user privacy or whether what it was saying was "just cute virtue signaling." Apple also has its own share of scandals, to be sure. These range from poor working conditions at Chinese manufacturing plants to antitrust issues in the App store. None of these have raised alarm bells with US consumers or stood in the way of Apple's growth. By and large, Apple has avoided scrutiny by being relatively boring. Apple now spends more time iterating existing technology than innovating new technology, and so it is not nearly as disruptive as it was when it invented the Mac or the iPhone. At this year's Worldwide Developer Conference, Apple rolled out new features like group FaceTime that were effectively just improvements on old features. They also released new "digital health" tools designed to reduce screen time and help parents monitor their children's use of Apple devices -- further burnishing their "good guy" image. Finally, and perhaps most importantly, Apple is not on a path toward monopoly status. Amazon, Facebook and Alphabet, Google's parent company, are all taking up greater market share and raising concerns about anticompetitive behavior. "They may not yet be ripe for such extreme regulatory action, but as they consolidate control of their markets, negative consequences for innovation and competition are becoming evident," the Wall Street Journal's Christopher Mims wrote last week. "Apple is considered more vulnerable to competitive disruption," he wrote, "despite the fact that it tops the tech world in revenue, profit and market capitalization."